Thos. 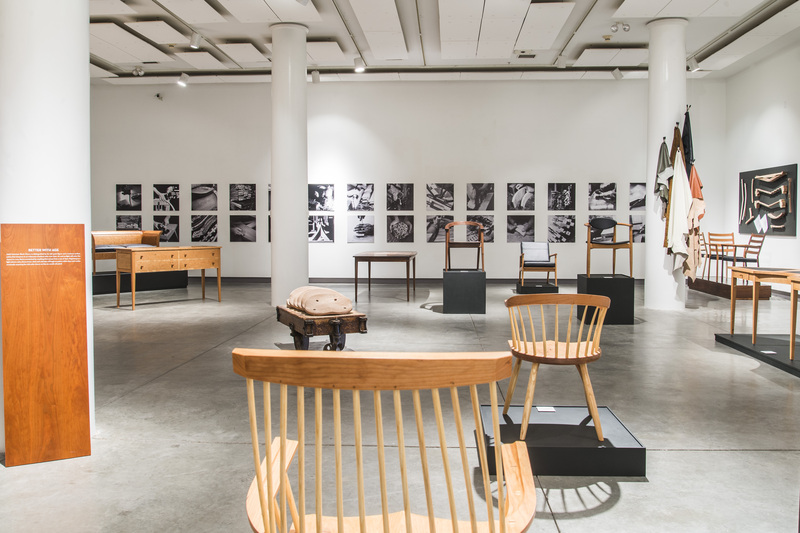 Moser: Legacy in Wood was organized by the Institute of Contemporary Art at Maine College of Art and curated by Guest Curator, Donna McNeil. 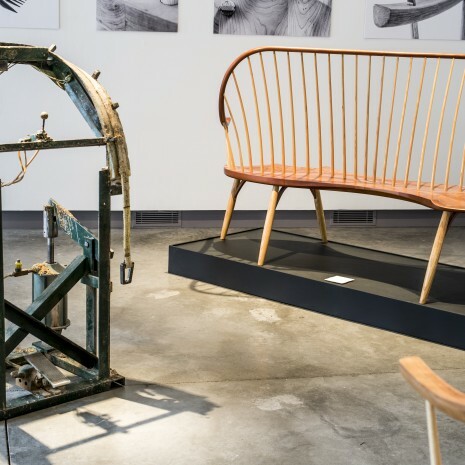 Connecting the past to the future through fine wood craftsmanship, Thos. 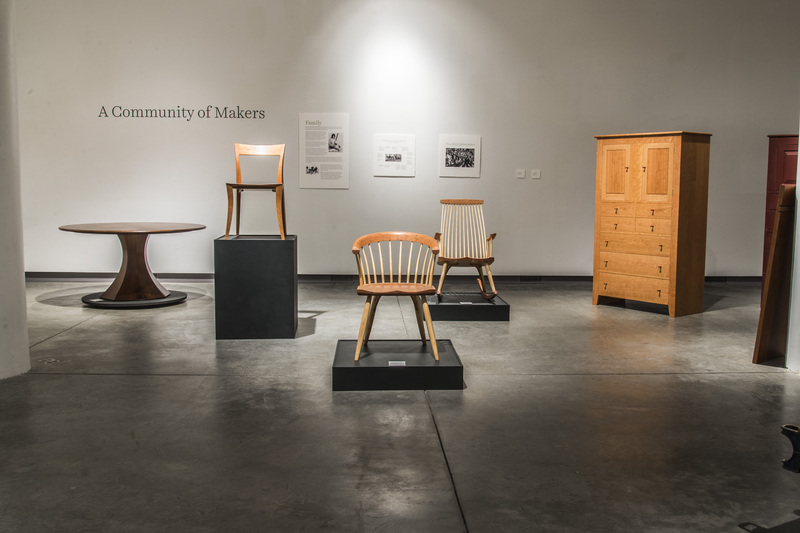 Moser, Cabinetmakers is one of Americas finest furniture-making endeavors. 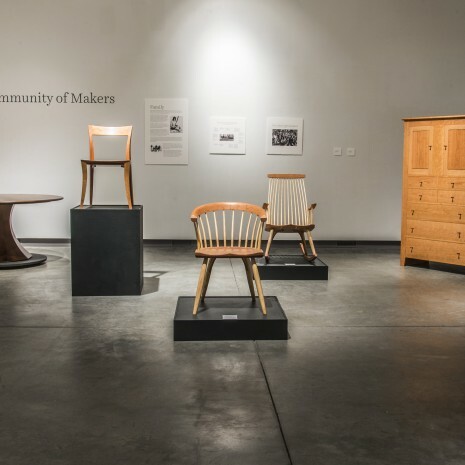 This exhibit surveys their 44 years of engagement with wood: Thomas Moser’s struggle to find himself after being orphaned at eighteen, his learning through long-dead masters, his decision to leave a tenured teaching position to pursue furniture making full-time, and his aesthetic and entrepreneurial choices throughout life. 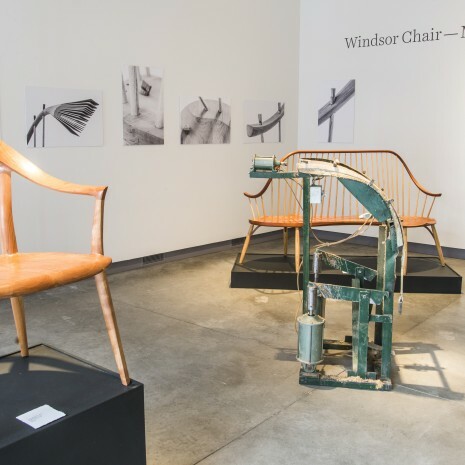 At a time when artisans are searching for meaningful ways to engage with their work and their audience, which can afford them fiscal independence, Thomas Moser’s journey provides an example of devotion to artistry and craftsmanship that is uncompromisingly ethical while generating a livelihood for his family, a community of artisans and delivering to the world objects of great beauty and utility. 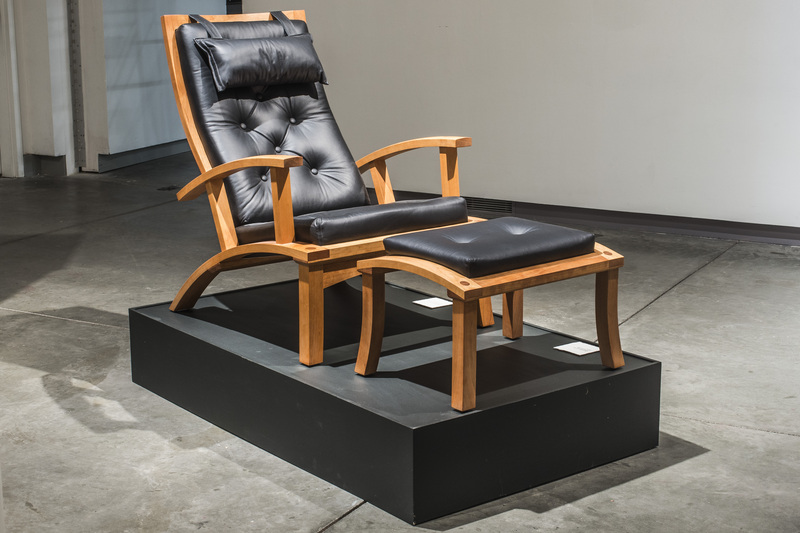 This Institute of Contemporary Art at Maine College of Art retrospective is the first exhibition to examine the central importance of Thomas Moser to the world of fine furniture craftsmanship. 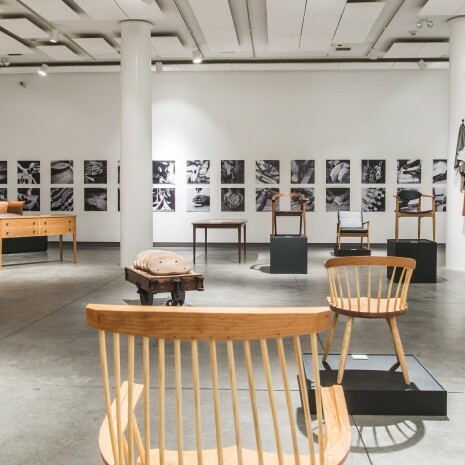 The exhibition will illuminate Moser’s approach to this most democratic expression of artisanship, both formally and conceptually, through the objects themselves; comprehensive didactics illustrating origins, timeline, influences, aesthetics, his relationship to and respect for wood; and displays of tools and joinery as well as a beautiful accompanying catalogue. 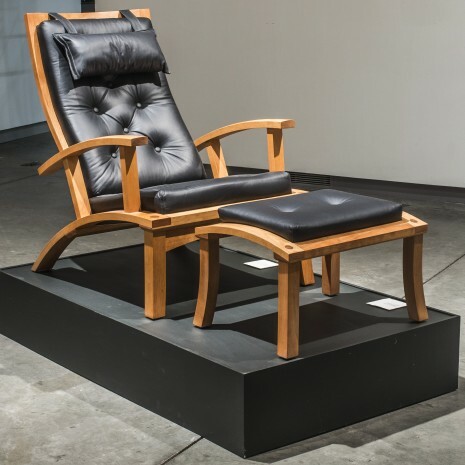 The work included in the exhibition spans four decades; in many instances walking the viewer through the growth of a chair from early design iterations through several design changes or variations on a central theme, always returning to what Moser via Plato calls “ultimate chairness.” The driving aesthetic is reductive and includes the surety found through exposed joinery in chairs, tables, beds or desks fashioned to endure longer than the growth of the tree. 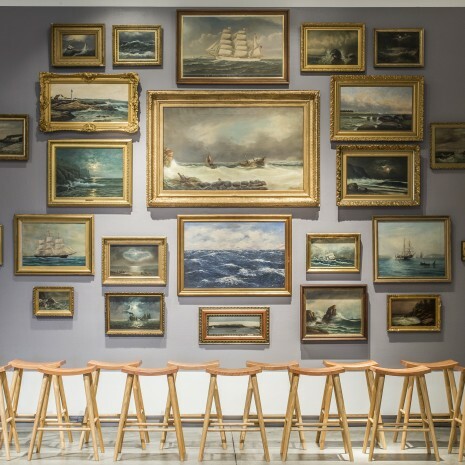 Thomas Moser was born in 1935, the second of two boys, to Josef and Sabina Moser, European immigrants, in Chicago, Illinois. Orphaned at eighteen, Tom dropped out of high school and joined the Air Force which sent him to Greenland where there “was nothing worth guarding and no one to guard against.” Discharged into upstate New York, Tom, through his veteran status wrangled himself entry to the State University of New York at Geneseo, married his high school sweetheart Mary Wilson, and continued his education at the University of Michigan, Ann Arbor and obtained a PhD. He came to Maine to teach at the University of Maine in Orono and a year later transferred to Bates College in Lewiston, Maine as professor of rhetoric. 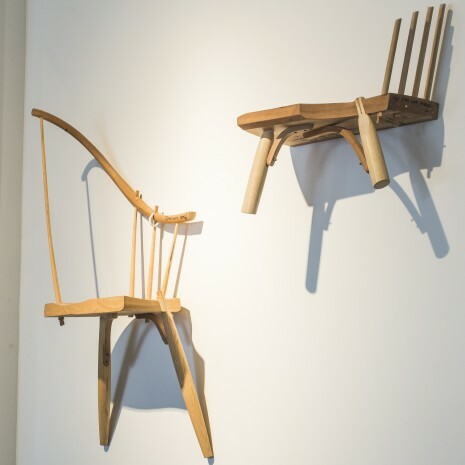 Throughout his life Tom Moser had always been making things out of wood and after fifteen years decided to leave academia to devote himself to his true passion, woodworking. That was 44 years ago and the story of those years, the birth and growth of Thos. 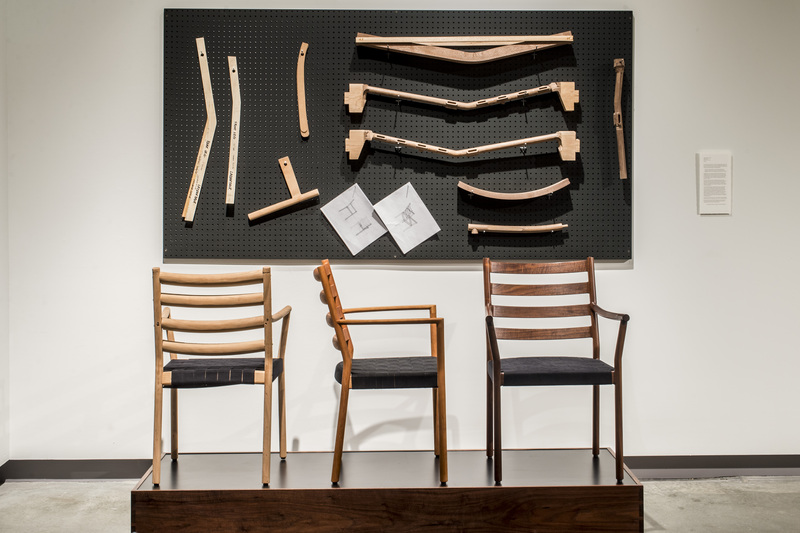 Moser Cabinetmakers, is told through this exhibition. As I approach my 80th year people often ask, “Why are you still working?” It’s not really working. It’s more like breathing or eating — it’s what I do. There is truth in the aphorism ‘If you enjoy what you do you never work a day in your life.’ As I write this I’m building an edition of twelve six-foot sculptures of the US flag out of cherry, maple and walnut, designing a storage Ottoman inspired by a cartoon in the New Yorker and prototyping two chairs using flexible sprung steel to connect the lower to the upper unit. Do I do this for the money? For the publicity these things engender? 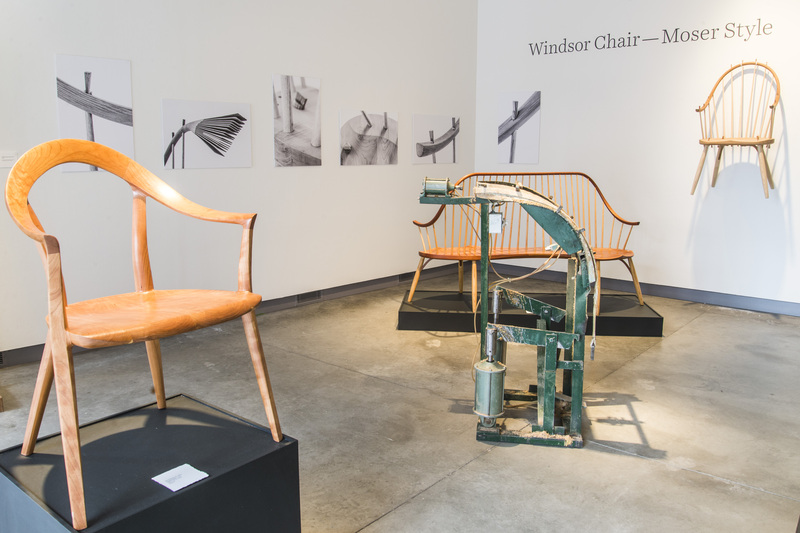 Does the world really need another flexible wooden chair? No, no and no but it’s what gets me up in the morning. Remember, all meaning ultimately is invented. 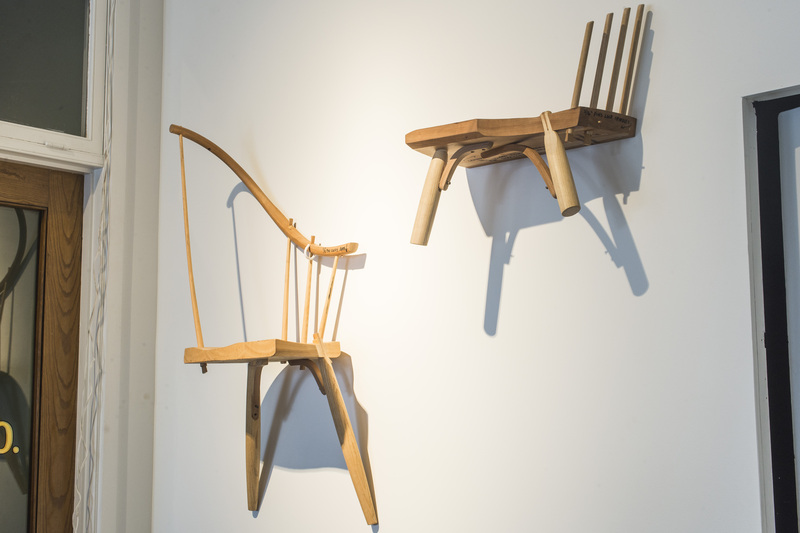 We mounted this exhibit with two objectives: 1) share with others the joy we have known in crafting furnishings that will surely outlive all of us, and 2) offer to the student of craft a role model which demonstrates that our national system of enterprise is alive and well, and we all have the freedom to become all that we are capable of being. The accompanying exhibition catalogue is a fully illustrated catalogue raisonne which includes a plate section containing a representative sampling of Moser’s oeuvre as well as personal historical photographs and images of process. The book and exhibition also contain a beautifully illustrated timeline, visualizing the objects and hallmarking events in the growth of Thos. 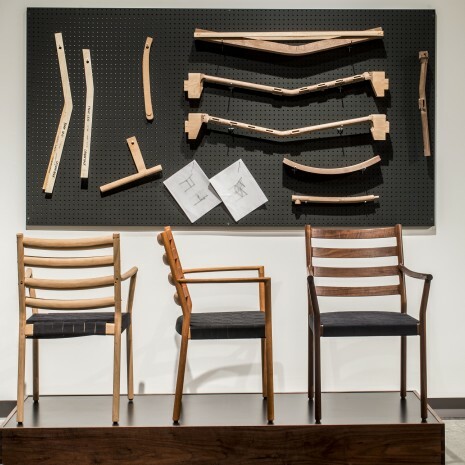 Moser, Cabinetmakers. 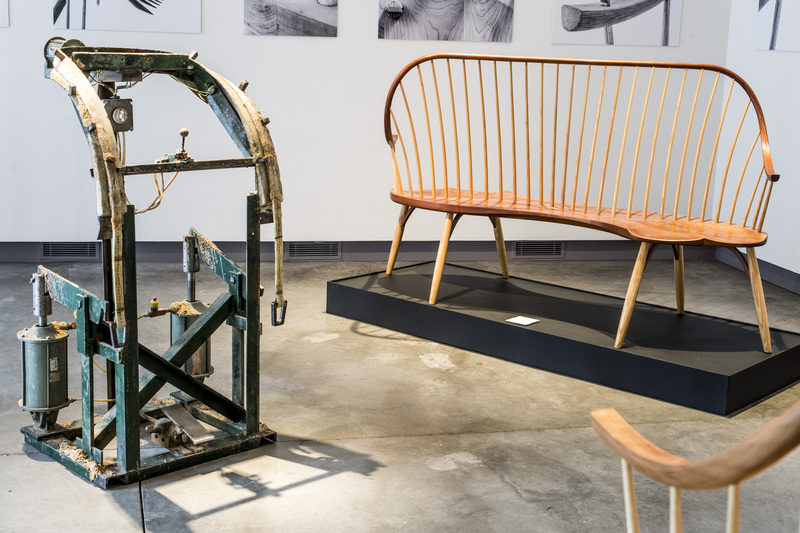 Essays are written by Thomas Moser with an opening statement by Mira Nakashima and additional essays by well respected woodworkers who apprenticed with Tom. 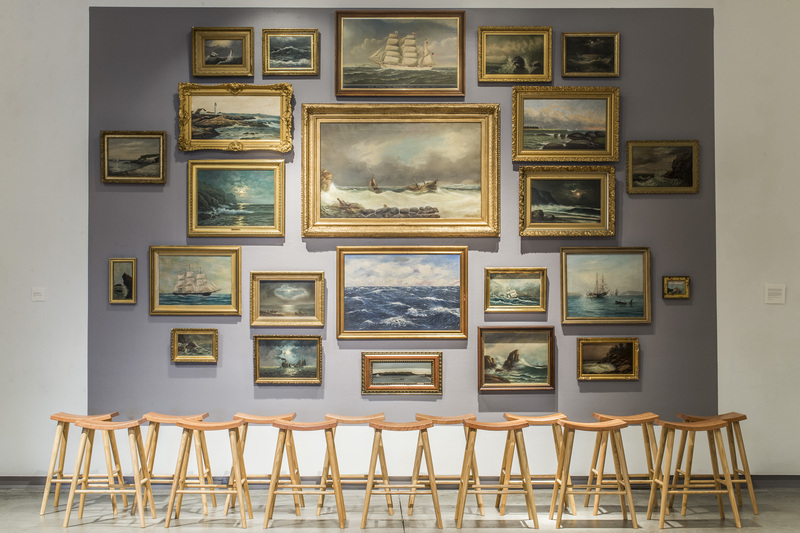 Sampling essays include: Beginnings, Influences, Aesthetics, From the Forest, Technology and the Hand, A Community of Makers and Entrepreneurship.